Heat oven to 350°F. 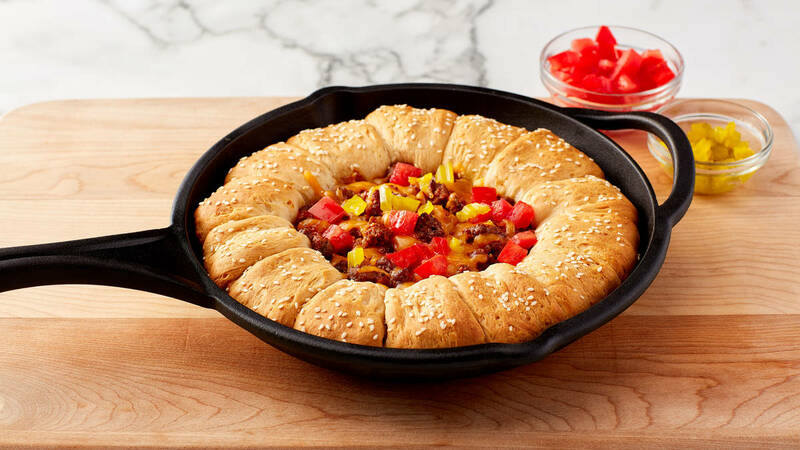 In 12-inch ovenproof skillet, cook beef, onions and steak seasoning over medium-high heat 7 to 9 minutes, stirring occasionally, until beef is brown; drain. Pour into medium bowl; stir in ketchup and mustard. Carefully wipe out skillet. Spray with cooking spray. Separate dough into 10 biscuits. Cut each biscuit in half to form 2. Press each half into 3 1/2 x 1 1/2 inch rectangle. Place 2 quartered pieces of processed cheese and 1 quartered strip of bacon on one half of each rectangle. Fold dough over cheese and bacon (do not seal), and place around edge of skillet. Brush biscuits with melted butter; sprinkle with sesame seed. Pour burger mixture into centre of skillet. Bake 30 to 35 minutes or until biscuits are cooked through and deep golden brown on top. Top beef mixture with shredded Cheddar cheese. Bake 1 to 3 minutes longer or until cheese is melted. Top beef mixture with tomatoes and pickles. Serve with a spoon, or crack open biscuits and use them to scoop burger dip inside. Want to skip the bacon? No problem. There’s no need to adjust cook time.